Any food product contains a number of nutrients, for example nitrogen, phosphorous, potassium, calcium, sodium and magnesium. In the case of milk, the predominant nutrients are nitrogen, calcium and potassium. That is why these are the main inputs on dairy farms, mainly in the form of fertiliser (urea, MAP, KCl, lime, etc. ), concentrates and roughage (maize silage, lucerne, etc.). The farm should be seen as a system defined by the farm boundary. Nutrients are brought into the farm through the farm gate (such as mentioned above), and nutrients are removed through the farm gate (in milk and animals). The question that needs to be asked is, are there more nutrients brought into, or removed from the farm system? Our research shows that a significantly higher amount of nutrients are imported than removed, i.e. more than double is imported than removed. The problem is, what happens to these excess nutrients? They are either accumulating in the farm system (soil root zone and farm dams), or being lost to the environment (downstream water, groundwater, atmosphere, beyond the root zone in the soil). 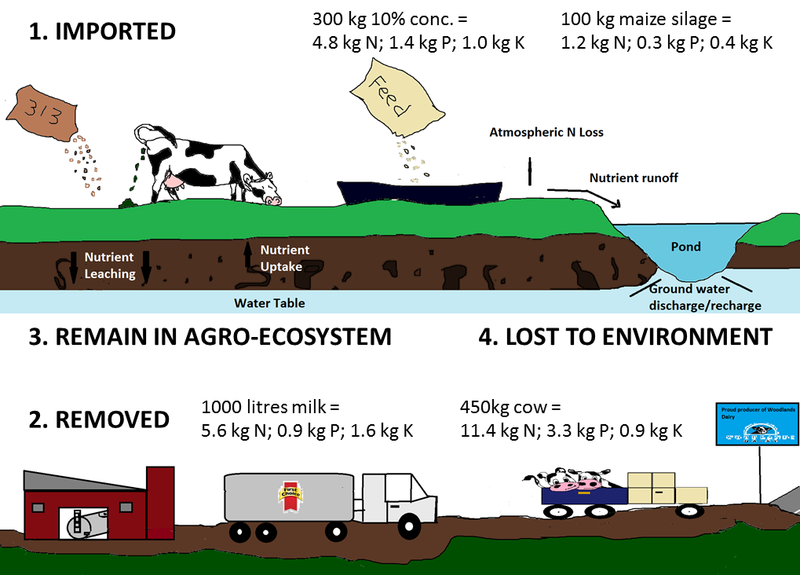 This is both an economic waste, as nutrients cost money, and a negative environmental impact, as many of the nutrients (e.g. N and P) are pollutants. There are four things that can happen to nutrients in a farm system. They are either imported, removed, remain in the system or are lost to the environment. The next question is naturally, what can farmers do about this? Well here are some strategies that we have discovered. Efficiently utilise concentrates, a good goal to aim for is the reduction of grams of concentrates fed per litre of milk produced. Good pasture utilisation, at the correct stocking rate, limits the need for imported roughage as the bulk of the feed required is grown on the farm. Healthy soil, which contains a diversity of beneficial microorganisms, breaks down organic forms of nutrients in the soil into plant available inorganic forms. Improving the organic matter content in the soil results in a higher nutrient holding capacity, which further ensures better retention of nutrients applied in fertiliser. By limiting the amount of excess and unnecessary nutrients being imported in the system, you limit the potential loss to environment.